When I get excited about making a new recipe, it's usually for something sweet or baked like ice cream or scones. Not always, but usually. That's not to say that I don't like making healthy or savory things to eat, because I do, almost everyday. I just need to dig deeper to find inspiration for those kinds of meals. 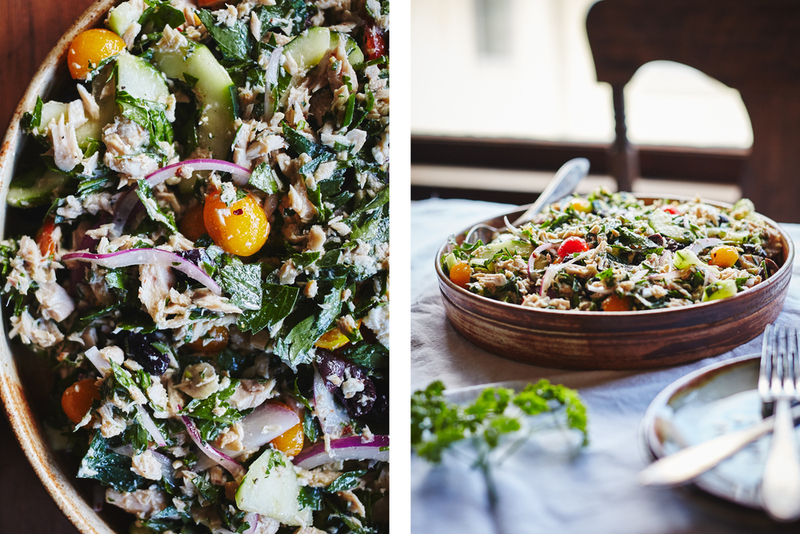 My go to lunch recipes are usually big bowls of grain salads with lots of veggies and a simple dressing. They can last me throughout the week and if I get bored with it I can make it into baked patties or add a large spoonful to scrambled eggs in the morning. I also like clean-out-the-fridge dinners because they usually come together quickly and it's satisfying to make a tasty meal out of odds and ends. This recipe kind of falls in the middle of finding inspiration and using what we already had on hand. I love the combination of cucumber and feta, so the idea for this recipe was originally just a simple cucumber-feta salad with parsley, olive oil, and balsamic. But when my mind starts thinking about developing recipes, it's hard to reign it back in. So, I ended up with a longer ingredient list than expected, all of which (except the olives) we had on hand. This recipe is super versatile, you can add any Greek/Italian/French tasting edible and it will be delicious. This salad comes together quickly and its ingredients are super versatile. If you don't have olives, try capers or even some anchovies. Hard-boiled eggs would also be delicious as would new potatoes. We served ours over some lettuce, but an open-faced sandwich may be next. 4. Pour the dressing over the cucumber salad and toss well. Crumble the feta on top and serve.